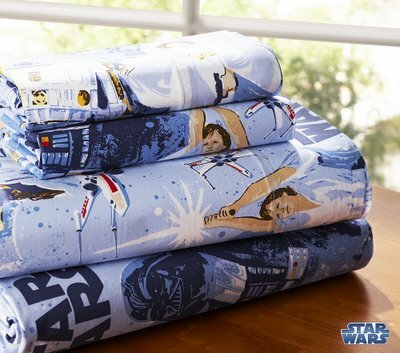 Dad tip #109: Pottery Barn Kids has vintage Star Wars bedding! Yup. The title says it all. Pottery Barn Kids has vintage Star Wars bed sheets! I TOTALLY had those sheets as a kid. The advice here is that you too can relive your childhood. And major mainstream retailers are helping you do it. I mentioned a couple weeks ago how The Gap is selling all kinds of pop culture t-shirts, including Star Wars ones. And now, Pottery Barn is offering up Star Wars bedding. I suppose I should also mention that Pottery Barn Kids also sells some Superman and Batman goodies, too. But, I think I might be able to build another separate post out of that topic another day. P.S. I am soooooo ridiculously sad that the Star Wars sheets aren't available in king.